To manage your urban forest you must know what is in it, since the forest is composed of many different trees. Where are the trees located? What is their condition, size, and species? These are questions that can be answered by conducting an inventory, an essential tool for developing a management plan. But an inventory is only as useful as it is up-to-date. Removals and additions of trees, maintenance and inspections, tree growth and transforming site conditions all change the look of the urban forest and its management requirements over time. Liability mitigation – By tracking maintenance, complaints, site visits, tree inspections, etc., a community has a record of the management of it's trees should a legal issue arise. This can show that the municipality has not been negligent, and reduce liability for damage or injury. 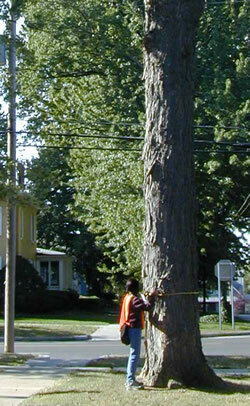 Budget justification – Tree budgets can often be reduced or eliminated in the face of other financial demands. Maintaining an inventory can assist with budget planning and requests, as well as show the impact of not budgeting for planting, maintenance and removal. Planning – Knowing what trees comprise your urban forest can help plan for the future: planting different species, locating trees needing replacement, finding locations for large and small trees, and discovering vacant planting spots. There are a number of ways to approach a tree inventory. Your community's resources will determine methods of data collection, the extent of data to be collected, and future use of the inventory as a management tool. Paper and volunteers – the simplest, most inexpensive method of data collection. Paper and pens are cheap and volunteers are virtually free. This method can provide a general picture of the urban forest and its needs. It can create community support for active management. Data entry into a spreadsheet after data collection can result in entry errors. Inexperienced volunteers may not be able to identify tree species or assess tree conditions. Data may be inconsistent and unreliable for practical management uses. Training and managing volunteers and entering data can be time consuming. Tablet computers or data loggers – data collection by in-house staff or by contractors or trained interns can be an inexpensive option. Data can be collected electronically and uploaded directly to an office computer. Database design is simple and inexpensive. This is a quick and efficient method data collection. It is easy update data if the community owns the data collection device. The database interface for reporting is not very user friendly. The database must be manually updated if the community lacks equipment. A stand-alone database doesn't interface with other programs. Proprietary software and consultants – computer programs designed specifically for tree inventory data collection. Data may also be collected by a consultant. Many inventory program can help with management with reporting and scheduling features (e.g. service requests, maintenance activities). Data can be collected by experienced consulting staff, providing consistent results. Additional contract options include GPS mapping of tree locations that can be used to populate a GIS map layer. A consultant can provide a summary report or a management plan. Technical support and software updates may be available for a period of time after purchase. The cost of software may be too expensive for some communities. Municipal staff may not be equipped to use the data or GIS layers. Municipality staff may not be sufficiently familiar with inventories and reports to know what options will meet their needs. Staff must know how to use the program and keep it updated. Before selecting a consultant, check references and ask those other customers how the process and the software worked for them. Determine if the consultant can deliver what your community is seeking. Ask to see an example of a summary report of the survey results and its management significance. This report should be part of any complete inventory, but it is not a "management" plan unless it gives specific recommendations and timelines for treatments, as well as budget information. Before selecting a software program, check the program's ease-of-use, system requirements, and technical support/training availability. Many programs have a free trial. When getting a price estimate for data collection a community should have a reasonable projection of the number of miles to cover and the average number of trees per mile. Data Interface and Management – a relatively recent option which is still developing in the growing market for mobile apps, utilizing wi-fi and cloud storage, allowing users to access and update inventory data from the field. Some programs or apps may be better suited for volunteers and community involvement while others may be focused on management planning and reporting. Ask: How is the data used? Who uses it? Some programs or apps may provide connectivity to management programs like i-Tree. Ask: What else can I do and how easy is it to do it? Different options for collecting and saving data may exist and may affect cost; whether data is hosted off-site on a company server or on a municipal server or is accessible via the internet. This may also affect how data is updated. Ask: Where is the data kept and how can I update it? Who has access to the data? GPS positioning can be collected within the app, although not as precisely as with a dedicated GPS unit, so a community must know its GIS abilities in order to determine costs. Ask: Are we relying on GIS layers for planning or do we have no plans to use GIS layers in the immediate future? Recently, the Urban & Community Forestry Program and the NC Urban Forest Council partnered to help fund development of an iPad app called Talking2Trees. Any community can test it with a 20 tree sample. As part of the partnership, Talking2Trees has made 1,500 tree records available to U&CF grantees and to NCUFC members for their inventory needs. T2T also provides, for additional cost, features such as maintenance history and TRAQ risk assessment. Full or partial inventories can be carried out, whether due to funding limitations or management priorities: all municipal trees, only street trees, only park trees, only risk trees, or boundary trees and line-of-sight, or historical/specimen trees. Available planting space at each location throughout your inventory is also useful to collect. This allows you to plan your future urban forest needs. List of Tree Inventory Software Programs from the US Forest Service, Northeastern Area. Comparison of Urban Forest Inventory & Management Software Systems from Urban Forestry South.